I have loved this show since it came out and I’ve always been very hard on every roger I’ve seen! Brennin Hunt, I love your portrayal and I am so sorry you were injured because I think had this show been live it would have been amazing. Jordan a different mark, but very good; except I missed the scarf! The show is a masterpiece! God bless Jonathan Larson! The cast was Fantabulous! I cried over and over! I lost my partner last year. We both were on the frontline during the worst of the AIDS crisis we lost many near and dear to us! The message reminds us that friends will always see us through the tough times! If Only the Broadcast Had Been This GOOD!!! As a certified "RENThead" since the movie version (I own that soundtrack as well) in 2005, I have to say that this is the best audio recording of Jonanthan Larson's award-winning Broadway phenomenon EVER. Unlike the movie soundtrack (which left several songs out), this television soundtrack contains ALL of the songs. The Original Broadway Cast album (which I also own) also contains all the songs, but the production values aren't as good as this one. I was not as impressed with the Jan. 28 presentation on Fox and almost decided not to buy this. Glad I reconsidered!!! 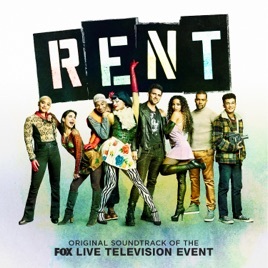 Long Live 'RENT'!!! !